Started this discussion. Last reply by Tephlon Mar 12, 2008. Finally, at long last... Batch Four! Batch Four needs more! Can you help out? Hi all, it's been TOO long between batches… and the world needs more NaniBirds! I really want to get Batch Four released into the world. Some folks submitted designs MONTHS ago and I just never got it together enough to do a Batch release. So I need your help! Special deal, 4 for 3 at the NaniBird shop! Hey Josh I hate to be a bother but I read your post on Batch 4 and I would love to be a part of it! But i dont have any computer tools to design the template so I always do my customs by hand because I have great drawings skills. But I see that the blank template is grey and the feet are yellow and the mouth is pink. My colored pencils do not work well with areas that have colors on them already so by any chance do you have a completly blank template? Thanks for compliment, and please allow me the honor of doing the same.....nani?birds are awesome any way you look at em. Nice and easy on the construction side with a very very wide range of possibilities for custom designs as well. That being said i am curious as to where a blank nani could be found....i have an idea of what id like to do. Do you have any objections to my posting a blog about them? Thanks for the links! I have a great idea for the template! Could I possibly have a freehand file of the template? It will be easier for me if I can, but I can still use the illustrator file if you can't. HI! 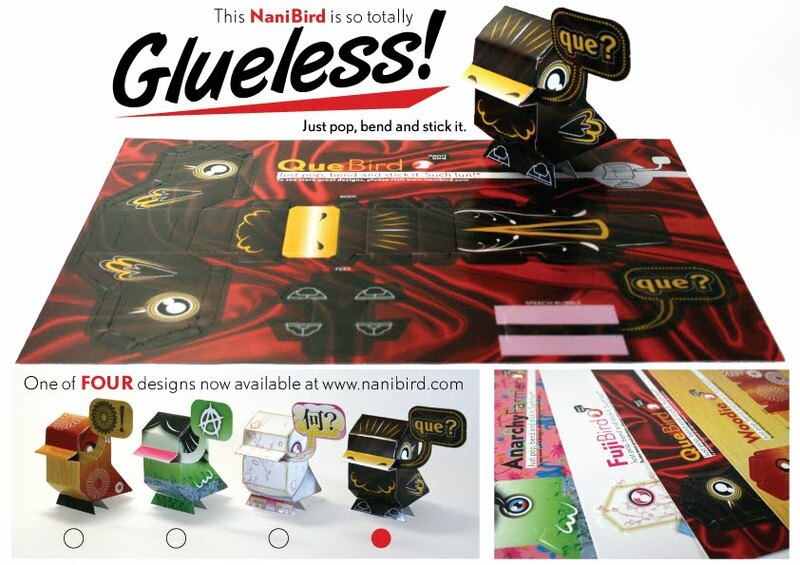 I want to do a custom of the nani bird. Can you give me the illustrator or freehand file? please! It will be a pleasure! where can I found the Nanibirds template? I'm addicted to your birds!